-- Please Choose an Option --	10" 11" 12" 13" 14" 15" 16" 17" 18" 19" 20" 21" 22" 23" 24" 25" 26" 27" 28" 29" 30" 31" 32" 33" 34" 35" 36" 37" 38" 39" 40" 41" 42"
-- None -- 0" 1/16" 1/8" 3/16" 1/4" 5/16" 3/8" 7/16" 1/2" 9/16" 5/8" 11/16" 3/4" 13/16" 7/8" 15/16"
-- Please Choose an Option --	8" 9" 10" 11" 12" 13" 14" 15" 16" 17" 18" 19" 20" 21" 22" 23" 24" 25" 26" 27" 28" 29" 30" 31" 32" 33"
Can build in thickness of 5/8", 3/4", 1", 1-1/4", 1-1/2", 1-3/4" and 2"
Replace your built in, pull out cutting board or under the counter board with a custom sized maple cutting board. We offer custom sizing up to 33" x 33" and up to 2" thick and can build to your exact specifications. Maple is a great choice for a replacement cutting board for your existing pull out, as maple is naturally antimicrobial, durable and resists knife scarring. Popular with chefs, maple has been time tested for centuries and is a native wood to North America. Our custom boards come in two different styles. The Straight Grain option is made with 1-2 inch wide strips of edge grain wood running lengthwise, while our Natural Grain choice is made of wider sections of mixed grain wood (4-5 inches wide) running lengthwise and has a more rustic pattern. Our custom maple boards are clean in appearance, naturally antimicrobial long lasting and is our most popular choice for custom board material. We also offer custom made pull out boards in cherry, walnut, plastic and other custom woods. Please email us if you have a particular request. Plus, each of our pull out boards is routed with a finger pull out to assist with pulling out the board, so no more pinching and squeezing if your original board lacked a groove. In addition, our pull outs all 1" thick or less feature what woodworkers call "breadboards", which are perpendicular ends that cap off each side of the cutting board. Breadboards add stability against warping and cupping, which is often an issue with pull out boards that stay wet and don't receive much air flow. All of our pull out boards are made by hand in the USA. Your board is clamped for 24 hours with food safe, water proof glue. The board surface is sanded to a 220 grit smooth finish, then finished with food safe mineral oil before packing. Expedited shipping is not available for custom projects. If you still have the existing pull out board, we recommend that you use that for your measurements for depth, width and thickness. We will build your board to your exact dimensions, so do not worry about tolerances if your existing pull out fits well. 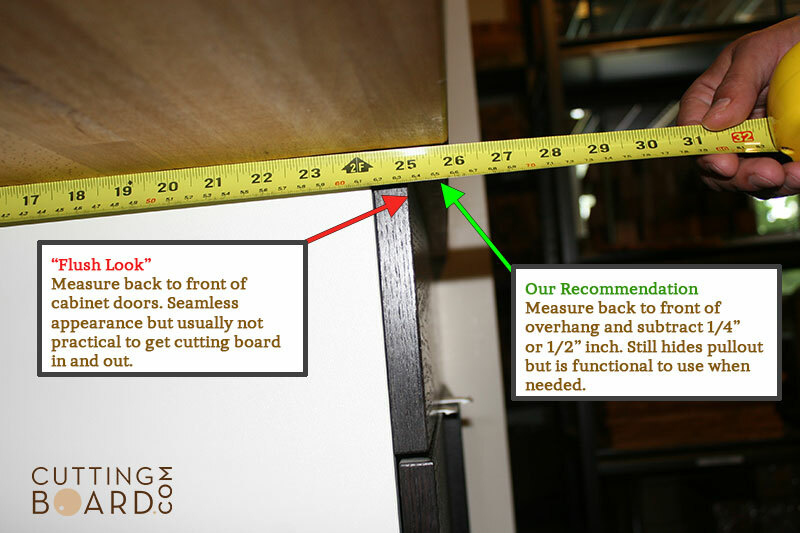 Board Depth: Measure from the front of the cabinet (right at the overhang) to the of the back of the cabinet or wall. Subtract 1/4" (this helps hide the pullout under the overhang) and this is your board depth. Depth Fraction: If your board depth is 15-3/4", then you would put 15" for board depth and 1/2" as your depth fraction. Board Width: Measure slot from side to side, where the pull out board would fit. Subtract 1/8" from measurement, so that board can slide in an out easily and is not too tight. Width Fraction: If your board width is 15-3/4", then you would put 15" for board width and 1/2" as your depth fraction. 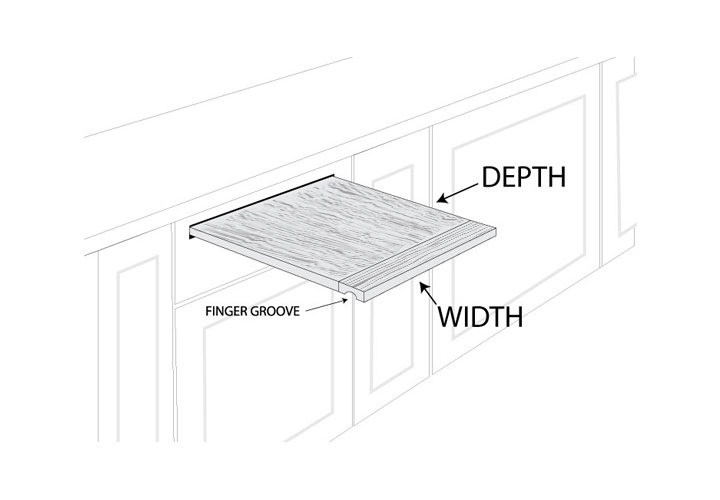 Edging/Corners: Please see diagram below for difference between Standard and Bullnose. Standard is recommended by default. Juice Groove: Also known as a juice well or moat, this is a groove that is routed into top side of the board to catch liquids and prevent spilling off the side. There is an added fee for this option. 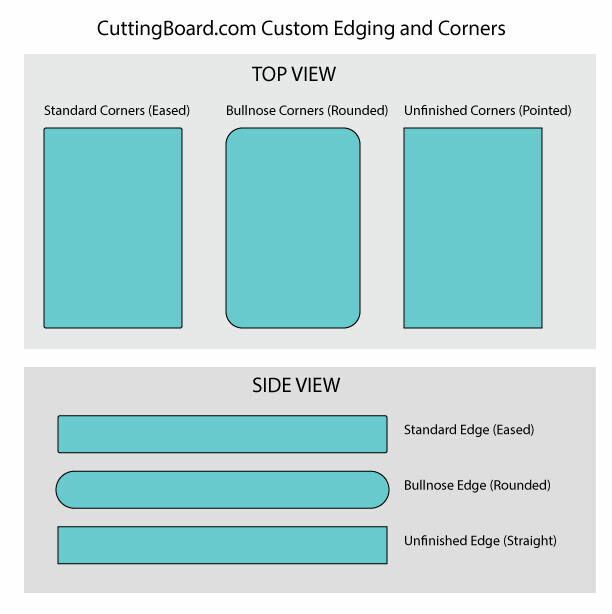 CuttingBoard.com is confident you will be satisfied with your custom cutting board and offers a one year guarantee with all custom work. If your board needs repairs or fixing, we will take take care of it! Note, our warranty does not cover abuse or misuse of cutting boards, including putting them into the dishwasher. Click the button below to add the Custom Maple Pull Out Cutting Board - Natural Grain to your wish list.